Displays temperature in either F or C, relative % humidity, includes wall mount bracket. Read temperature and humidity and record minimum and maximum readings for both. Relative humidity measurement is temperature compensated. 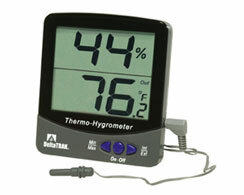 Includes external temperature probe for optional internal and external temperature measurements.